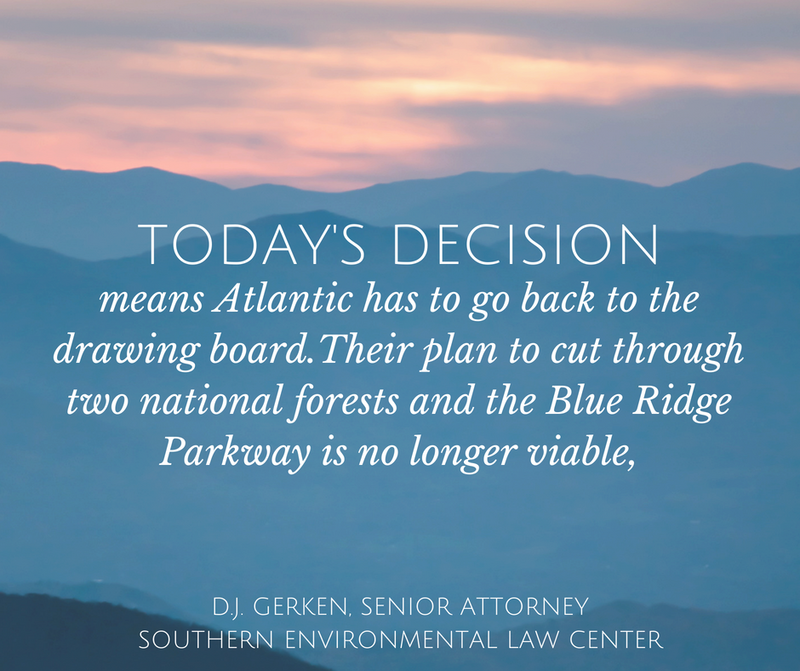 On August 6, 2018, the three-judge panel of the 4th Circuit Court of Appeals released a unanimous opinion on its May 15 Order that vacated the Fish and Wildlife Service’s biological opinion for the Atlantic Coast Pipeline. 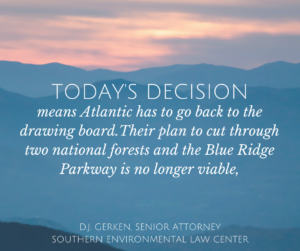 The long-awaited opinion, written by Chief Judge Roger L. Gregory, also vacated the Right-of-Way permit issued by the National Park Service for drilling under the Blue Ridge Parkway. The Court said the Fish and Wildlife’s “taking order,” authorizing the pipeline to “‘take’ — i.e. kill, harm, or harass — five species that are listed as threatened or endangered” is “arbitrary and capricious” because the so-called “take limit” is unenforceable. 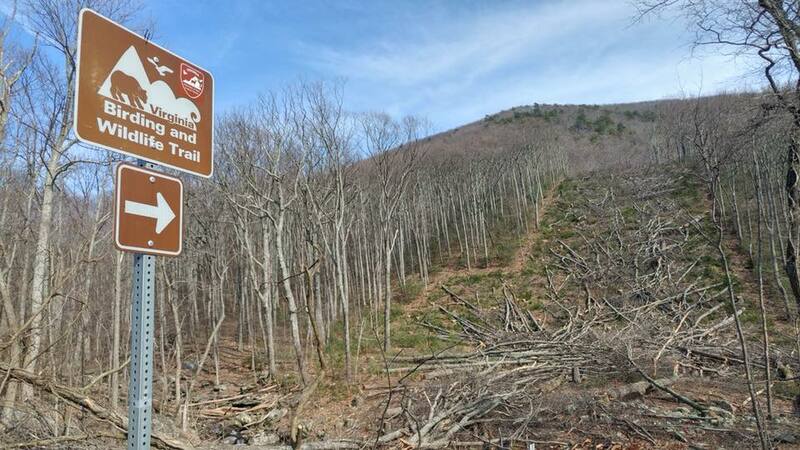 Defenders of Wildlife, the Sierra Club, and the Virginia Wilderness Committee, represented by the Southern Environmental Law Center, had challenged both the Fish and Wildlife Service and the National Park Service decisions. “Having concluded that both FWS and NPS erred in issuing their respective authorizations, we turn to the final question of remedy. Respondents argue that this Court lacks authority to vacate the agency actions under the Natural Gas Act. 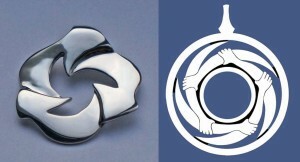 However, Respondents’ position is contrary to the plain text of the Natural Gas Act. The judicial review provision at issue provides, If the Court finds that such order or action is inconsistent with the Federal law governing such permit and would prevent the construction, expansion, or operation of the facility subject to section 717b of this title or section 717f of this title, the Court shall remand the proceeding to the agency to take appropriate action consistent with the order of the Court. This entry was posted in Certificates of Approval, Construction, Court cases, HDD, Natural Resources on August 6, 2018 by Ellen Bouton. At their meeting on July 19, 2018, the 5-member Nelson County Service Authority Board voted unanimously against a proposal to set a rate of more than 10 cents per gallon and a connection fee of $500,000 for the ACP, which wanted to purchase 40,000 gallons of water per day for up to two years. 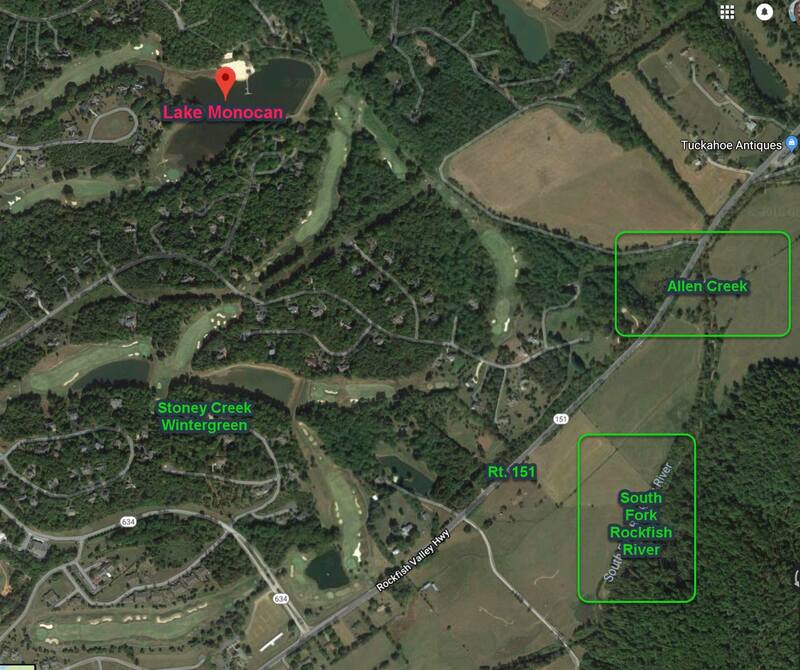 The water would have come from Lake Monacan, and the ACP wanted to use it for horizontal directional drilling to bore a path for the pipeline beneath the Blue Ridge Parkway, from near the Wintergreen entrance through to Augusta County. The proposed connection fee of $500,000 and the per gallon connection rate were more than 10 times the regular rate and would have resulted in about $3.5 million in revenue over two years for the service authority. Several NCSA Board members said they did not see the need for a rate scale that would accommodate huge construction or industrial projects that did not fit the vision of the county, and that approving the rate could bring risks and liabilities to the county. The Board’s legal counsel noted that, although the special rate and permit had been denied, the ACP could come back to the service authority asking to become a regular customer and pay the regular rate and connection fee. The Board then unanimously approved a new requirement that starting July 19, 2018, any applicant wishing to purchase more than 100,000 gallons of water per month would have to petition the Board for approval. According to ACP spokesperson Aaron Ruby, the company now has another source to meet their water needs, with about 10 tankers making 10 round trips daily to the construction site. ACP construction has not yet started in Virginia because the required permits have not yet been received from the Department of Environmental Quality and the State Water Control Board. This entry was posted in Certificates of Approval, Construction, HDD, Natural Resources, Water Quality on July 20, 2018 by Ellen Bouton. There are normally 5 members of the Board, one from each district, but Russell Otis resigned last week and thus did not attend. Tommy Harvey and Robert McSwain voted against setting a rate for Dominion, Gary Sherwood and David Hight voted in favor of setting a rate. Since there was a tie vote, the matter will be discussed again at the July meeting, at which time the composition of the Board will have changed, with Justin Shimp, Ernie Reed, and Jesse Rutheford replacing Harvey, Otis, and McSwain. This entry was posted in Certificates of Approval, Construction, Dominion, HDD, Water Quality on June 22, 2018 by Ellen Bouton. On Thursday June 21, 2018, at 2pm Nelson County Service Authority will hold a public hearing on the proposed water rates in the proposed contract between the Service Authority and Dominion. The contract would allow the Service Authority to sell 40,000 gallons per day of Wintergreen’s Lake Monocan water to Dominion to build the Atlantic Coast Pipeline, specifically for the horizontal directional drilling (HDD) under the Blue Ridge Parkway at Reeds Gap. That’s 29 million gallons of water Dominion wants to buy over the next 2 years to build ACP and use for drilling fluid. Below is a map showing Lake Monocan, the proposed source of water for Dominion’s pipeline drilling fluid, and the surrounding area. This entry was posted in Construction, Events, HDD on June 17, 2018 by Ellen Bouton. The WPOA filing discusses debris flow and rockslides, ground water, soil and geologic concerns, and drilling under Reeds Gap, and includes detailed diagrams and LIDAR mapping. Wintergreen engineers and geologists use underground radar to show DEQ and FERC that ACP’s pipeline is not safe to build on on unstable land, fault lines, and underground aquifers. One result — water gushing from ACP soil borings. Read the full WPOA filing here, with copies of their previous relevant filings as attachments. 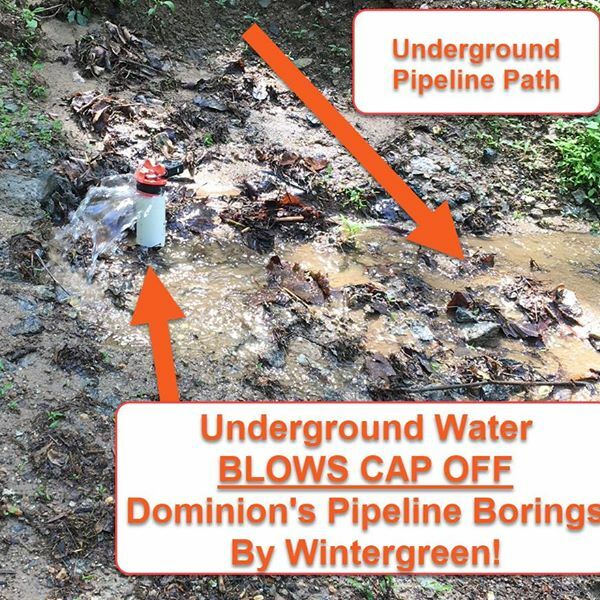 Blue Ridge Life news coverage includes photographs, discussion with Jay Roberts, Executive Director of WPOA, and a brief video of water pushing out around a locked cap on a test well within a few hundred feet of the entry-exit of Wintergreen Resort. The story was also covered in the Richmond Times-Dispatch on 6-17-18 (for digital subscribers only) and in the Daily Progress on 6-18-18. This entry was posted in Construction, DEQ, Dominion, Environmental Impact, HDD, Pipeline Route on June 13, 2018 by Ellen Bouton.